Football Jumpers .com » Blog Archive » Waterproof Football Jumpers ? Are Football Jumpers , Jerseys , Guernseys , waterproof ? With torrential rain in Queensland , Northern NSW , and Victoria , causing rain , storm and flood damage , it begs the question . 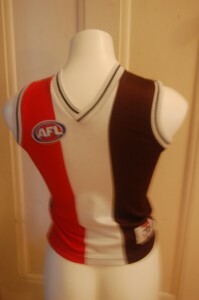 The current style of afl , jumper , jersey , guernsey is designed from modern , man made fabrics ,with names like climatech and polydri . It conjures up visions of aerodynamic , space age like suits , with mere mortals inside . Are they waterproof though ? Yes , for the purposes of playing AFL Aussie Rules Footy . No , in the current torrential rain conditions . Even the humble footy jumper cannot stand up to the unseasonal deluges , of recent times . They look good though , even drenched , as it all adds to the drowned rat look , currently favoured by most of Australia . This entry was posted on Friday, January 14th, 2011 at 9:27 am	and is filed under AFL, football jumpers, NRL. You can follow any responses to this entry through the RSS 2.0 feed. Both comments and pings are currently closed.